Choc-co-late = Chocolate! What more is there to say, really? Chocolate. I love it. It's my secret love affair. I could eat a whole bar if I don't institute strict rationing guidelines in advance. Last week, I received a beautifully wrapped Valentine's Day gift from the big city of Dallas - a sweet treat from the very urban chic Madame Amber of Red Tile Studio! She sent a box FULL of locally made, artisan chocolate and nearly put me into a coma. (just kidding, Amber - I didn't eat it all in one sitting!!) Handmade chocolate is simply put - AH~may~zing. The chocolate shop Dude, Sweet Chocolate in Dallas doesn't sell on Etsy, but there are so many talented chocolate makers who make the most decadent sounding creations. 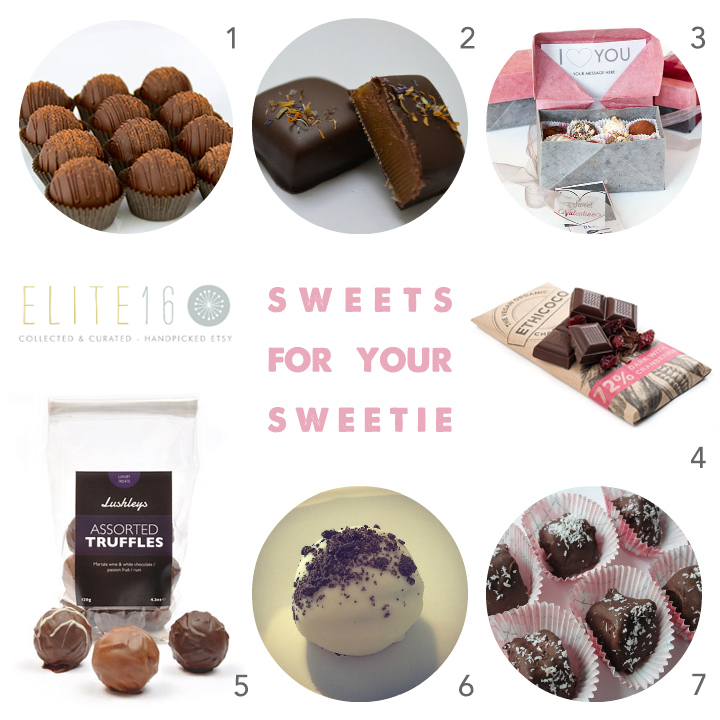 If you're looking for a Valentine's Day gift that is sure to please, take my advice and go for the chocolate! Who's with me on this one?